The chickens are happily laying a ton of eggs these days and we’ve been fueling up on eggs almost every morning before heading out for farm chores. I really love this simple breakfast of fried eggs with lemon yogurt and fried green garlic. It’s almost too simple to warrant as a blog recipe to share but we’ve been eating this often so I thought I’d let you all decide if you want to give it a whirl at home. This is more of a “method” rather than a strict recipe so play around with the ingredients. The green garlic has been making an appearance in our CSA member’s boxes for the past few weeks and one of my favorite ways to enjoy them is to simply dice them up and fry them in a little oil. They’re a great garnish for eggs, pasta, avocado toast or even sprinkled on a salad. You can usually find green garlic at the farmers market this time of the year however, if you can’t get your hands on any you can substitute with garlic scapes or even scallions if need be. 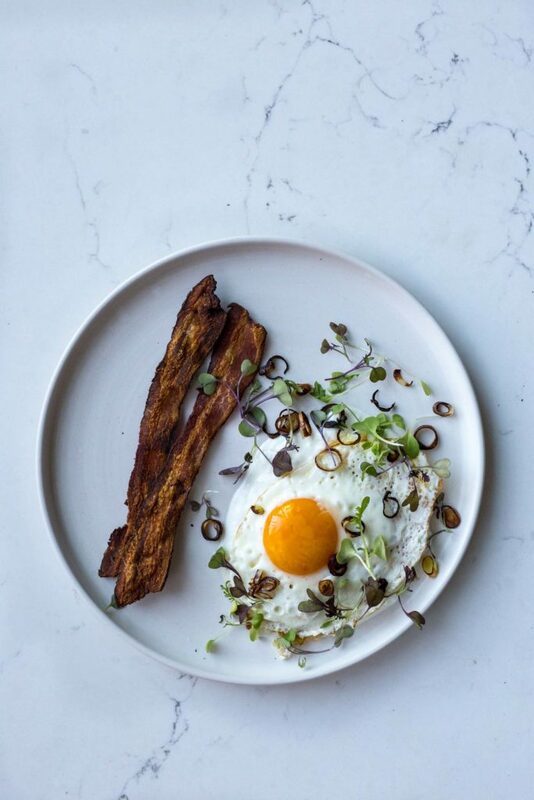 The lemon yogurt is tangy and perfect with the eggs and a side of extra crispy bacon. Whisk together the yogurt, herbs, lemon juice, lemon zest and sprinkle with a pinch of salt and pepper. Taste for seasonings and adjust as needed. Heat 2 tablespoons of olive oil in a small skillet over medium-high heat. Once the oil is hot add the chopped green garlic and fry, shaking the pan often (being careful as the oil can splatter) until the green garlic is crisp tender and turning golden brown on the edges, about 3 minutes. Remove from the heat and let drain on a paper towel lined plate. Heat a little butter or oil in a nonstick skillet over medium heat. Add your eggs and fry until the whites are set but the yokes are still slightly runny. About 5 minutes. Spread a little of the yogurt mixture onto a plate and top with your eggs. Sprinkle with salt and pepper and top with the fried green garlic, micro greens and serve with a side of fried bacon.